A group exhibition of art will be on display - and for sale - at the Daily Grind Cafe, 1500 West Georgia Street, Vancouver, starting December 9th. Participating artists will be Agata Teodorowicz, Famous Empty Sky, John Steil, and Gary Sim. Cafe hours are 7:00 a.m. to 4:00 p.m. from Monday to Friday. 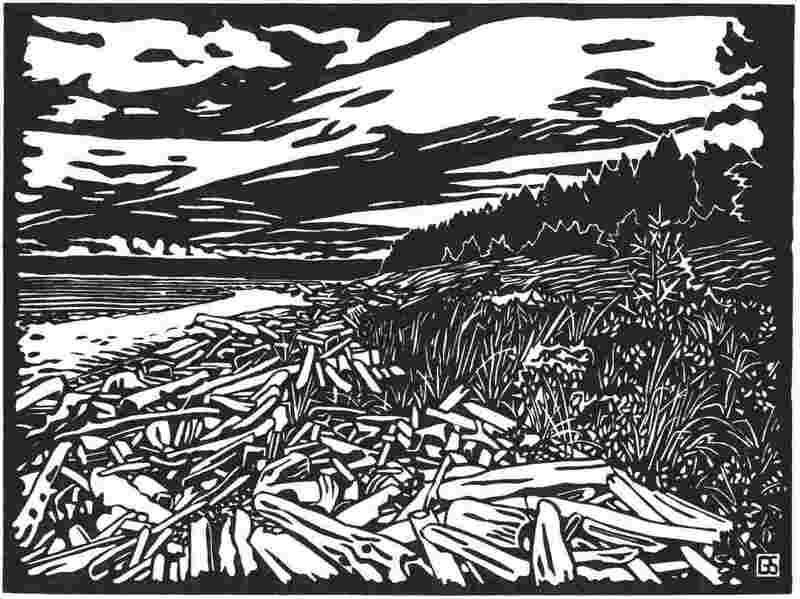 December 4 2005 - new linocut SOUTH SHORE issued. A new linocut print SOUTH SHORE has been issued. The image shows a view of the south shore of Savary Island, B.C., looking west. Please refer to prints page for more information. BUNDLE IT UP! - the Winter Show 2005 of the Malaspina Printmakers Society - will be on display from November 29, 2005 until January 22, 2006. The official opening will be held on December 8th from 7 - 9 p.m. at the Malaspina Gallery on Granville Island. Come along and enjoy the art and festivities! A number of Sim block prints are available for purchase from the exhibition, either framed or shrinkwrapped. The photo above shows a portion of the salon-style exhibition, with work by many artists on display. Sim print SNOW ON ELMS is visible bottom right, and RUN near bottom left (2nd in and up). Two additional Sim prints are in the intitial "hang", but the display will change as works are sold and taken away. If you want to ensure that you see all of my work, simply ask the gallery staff to show you anything not otherwise on display. 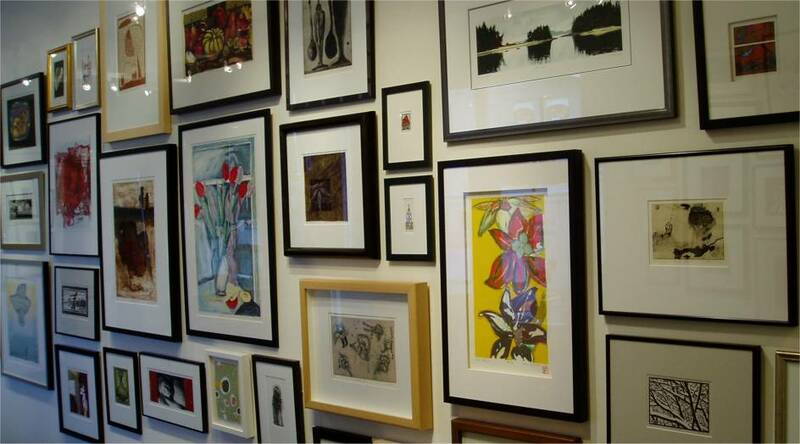 The Malaspina Printmakers Gallery is at 1555 Duranleau Street on Granville Island. Gallery hours are Monday to Friday 10 a.m. to 5 p.m., and Saturday / Sunday 11 a.m. to 5 p.m. For more information contact the gallery directly at 604 688 1724. 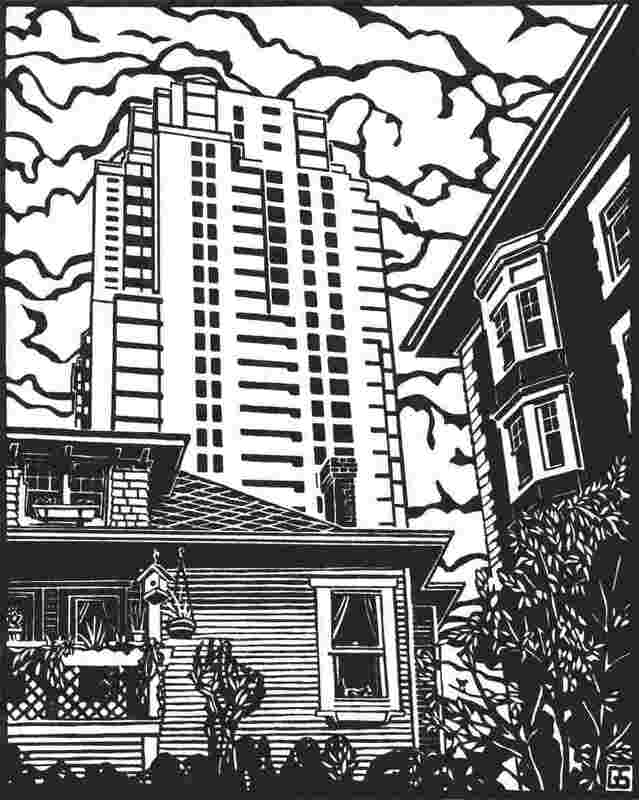 November 28 2005 - new linocut HIGHER RISES issued. After a week of cutting the block, a new linocut print HIGHER RISES has been issued. The image shows three eras of residential living at the north end of Bute Street in Vancouver. Ironically, the high rise in the background - at about 30 stories high - will soon be relatively tiny compared to the 80 storey tower now being built a few blocks away. Please refer to prints page for more information. 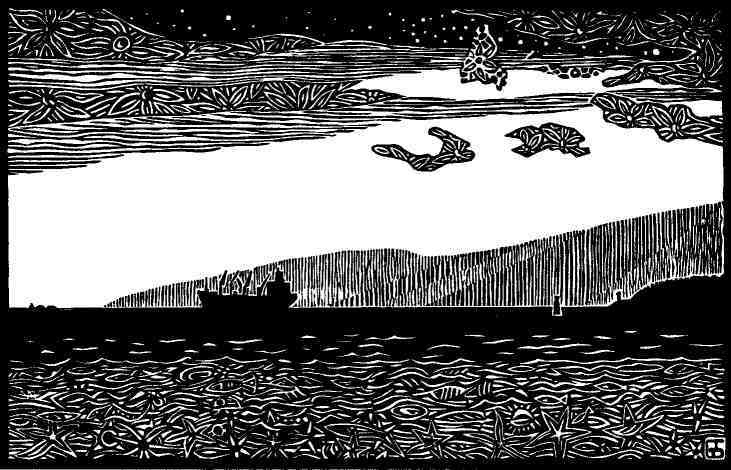 November 18 2005 - new linocut LOOKING AWAY issued. A new linocut print LOOKING AWAY has been issued. The image shows a view of English Bay, seen from the seawall in Stanley Park. It was a perfect sunset, you could see from stars to starfish. Please refer to prints page for more information. For the second year, in support of the Alcuin Society and their work, Sim Publishing donated two limited edition prints to the annual Alcuin Book Auction, held November 12th at the University Golf and Country Club. Prints LIONS GATE and LAWN BOWLERS were sold to appreciative bidders. Sim Publishing also donated and sold one original pen and ink drawing by Sam Black that had been used for the first Alcuin Society book "A Theatrical Trip for a Wager". Sim Publishing continues to add information to this flagship project. Most recently, the 1912 and 1915 B.C. Society of Fine Arts exhibition catalogues were transcribed, adding over 300 paintings, and another 15 artist biographies were created. The total number of files in the project is now 1,240, printing out on 1,930 pages. A few items are worth noting here. After much travail, Sim completed the wood engraving commission for the "printer's mark" project, and only just submitted the block to the Society for review. Three articles by Sim are forthcoming (apparently) in the next three issues of Amphora, one about the making of the cover image for issue 135, another being the 40th anniversary review of the journal itself, and a new one recently submitted about collecting things and trying to save them. After numerous visits to Malaspina Printmakers gallery on Granville Island, and buying the occasional print there, I finally decided to join the Society. I signed up in mid-October, and shortly afterwards had some prints accepted to the Society's Christmas exhibition, opening on November 29th! I hope to have some shrink-wrapped prints in the bins in the gallery too in the near future. This is exciting, and I look forward to a productive collaboration with Malaspina. Following the stress and exhaustion of preparing and hanging the Viewpoints exhibition at the AIBC, an opportunity came up to visit Savary Island for a few days and unwind a bit. Although getting to the island and back does involve further stress and organization, it's worth the effort. A very relaxing and pleasant two days was spent wandering the beaches and forest, and simply lounging on the deck sketching. The photographically amenable scenery prompted a flurry of digital picture taking that finally ceased after about 400 photographs were taken. A moment of terror was caused by an attack of black wasps whilst foraging up a trail, but no stings were received by any in the party, nor injuries occurred whilst fleeing in panic, so all was well once the pulse got back into two figures. Sim's artwork was featured at the Architecture Institute's Gallery for six weeks in a two person exhibition titled Viewpoints, from September 8 to October 20, 2005. Sim exhibited one photograph, several block prints, three etchings, two watercolours, six pen and ink drawings, three framed assemblages, and numerous small sculptures in the successful show. A review in the Vancouver Sun featured two of Sim's pen and ink drawings as well as a biographical summary. The Fall 2005 issue of architectureBC featured a review of the exhibition. Having just spent two hours updating this web page with doings of the last two months alone, it continues to surprise me how much I've done in the past year as listed on this web page alone. I've become a regular contributor of art and writing to Amphora and architectureBC, created eight new block prints and numerous drawings and sketches, curated seven exhibitions at the Daily Grind Cafe, started a new day job (recently receiving annual review and raise), joined the Alcuin Society, became a member of the AIBC Gallery Advisory Committee, was re-elected as a Director of the Emily Carr Institute Alumni Society, sold or donated numerous artworks, continued positive relationships with the National Gallery and the Vancouver Art Gallery among others, made significant additions to and marketed and sold numerous copies of Art and Artists in Exhibition: Vancouver 1890 - 1950, continued research and collecting in support of additional entry for the project, wrote some occasional papers and poems, created and maintained (sporadically) this web site, volunteered for and sponsored the Writers Festival (as well as hiring my first poet - Shane Koyczan - for the Volunteer Party), took a couple of thousand digital photographs... ...and so on... ...not to mention living a life (groceries, cooking, eating, laundry et al), going for the odd bike ride and walk... hopefully I can keep up the pace for a few years to come. Okay, so we didn't win the Dwyer Award. Partly to ease the tension of the three month long wait for announcement of the winner, we added a lot more information to the project. Additional exhibition catalogues were entered, more artist biographies were created and many expanded, revisions and additions were made to various lists and articles. Numerous additional references have been sourced or collected in the past few months, enhancing the bibliographical and finding aid side of the project. A few previously unlisted artists were added to the index, now listing over 1,700. This lack of discovery of "new" artists is encouraging, since it indicates that I may finally be approaching a complete listing of the artists who qualify for entry on my list. I might add that I originally expected to list 300 or 400 artists, and the vastly greater number of them who turned up have significantly stretched my intended completion date for the project. Received this week - a letter from the Alcuin Society, wondering if Sim would like to do a commissioned woodblock print to be issued in a future issue of Amphora. The idea is to create a printer's mark that should have once existed, should exist now, or should exist in the future. A number of artists are being asked for their expression of interest in this project. Accepted and completed printer's marks will each be printed in editions of 500 by Barbarian Press and tipped-in to editions of Amphora as keepsakes for subscribers. We are thinking seriously about this. April 2005 - Winner of 2005 Melva J. Dwyer "revealed"
Three months of suspense have ended with the award of the 2005 Melva J. Dwyer award to, no, alas, not my project, but to the National Gallery of Canada's massive 2,000 page 2 volume bilingual publication The Index to Nineteenth Century Canadian Catalogues of Art. Congratulations to the winner, especially for the huge amount of work involved (they estimate 8,000 hours work) in researching a difficult period of time and compiling the results into a list of 4,500 artists and 1,660 collectors. Well done, and much needed. Ironically, their work is based on exhibition catalogues just as is my project Art and Artists in Exhibition: Vancouver 1890 - 1950, they simply "out-art'ed" me by a factor of three times the amount of information compiled, in about three times the work done (probably by about 10 times the people and resources). Considering that I have had no financial support provided or work done on my project by anyone except myself, I think I gave them a pretty good "run for the money". Sigh, well it's back to life as usual. I would again like to thank Michael Clark at Emily Carr Institute Library for the idea of nominating me, and Cheryl Siegel at the Vancouver Art Gallery Library for actually nominating me and "making my case" to the three jurors. Much appreciated, perhaps we can try again another time. A quiet day of cutting a block resulted in the print Run, perhaps getting into a pre-Olympic mood. Three states of the block have been printed so far as artists' proofs, but a formal edition has not yet been resolved. A print of the third state was scanned for use as a greeting card and a sheet of artistamps, used to date for mailouts by the publisher. After a fair amount of effort matting and framing eight early B.C. watercolours by Maud Rees Sherman (1900 - 1976), the show was "hung" on March 24th and will remain up until June 21st. As far as the curator knows this is Sherman's first solo exhibition, despite her extensive recorded exhibition history from at least 1920 to 1960. The watercolours were painted circa 1920 at Desolation Sound, Nanaimo, Vancouver, Seton Lake, Port Alberni, Victoria, Esquimalt, and Richmond, B.C. In June 1926 an article titled Places To Sketch by Sherman was published in The Paint Box, the first edition of the annual from the Vancouver School of Decorative and Applied Arts. In her article she discusses numerous places to paint in British Columbia, all of the paintings in this exhibition were painted in locations that she mentions in the article, and thus the exhibition's title. The Daily Grind Cafe is at 1500 West Georgia Street, and is open from 7:00 a.m. to 4:00 p.m. from Monday to Friday. Somewhat unexpectedly, I was asked to submit prints to the Alcuin Society to be considered for publication in Number 137 of Amphora. The Editor selected two prints for publication, Waiting, published full page (31), and Shucking Shed, Lund, published half page (35). Other artists included in the issue are Andrea Taylor, Arnold Shives, and Dean Lauze. The Editor also included a small news item about Sim Publishing's nomination for the 2005 Melva J. Dwyer Award. Sim Publishing advertised in Amphora for the first time in this issue, taking the entire outside back cover to advertise Art and Artists in Exhibition: Vancouver 1890 - 1950, GARY SIM - SELECTED GRAPHIC WORK 1998 - 2004, monographs, original pen & in drawings, limited edition prints, and miscellany. A proposal to the Architectural Institute of British Columbia to write a series of articles titled The Digital Drawing was accepted, and the introductory article by Gary Sim was published in the Winter 2005 issue of architectureBC, the journal of the Architectural Institute. Future articles will include Input, Output, Coordination, and Management. 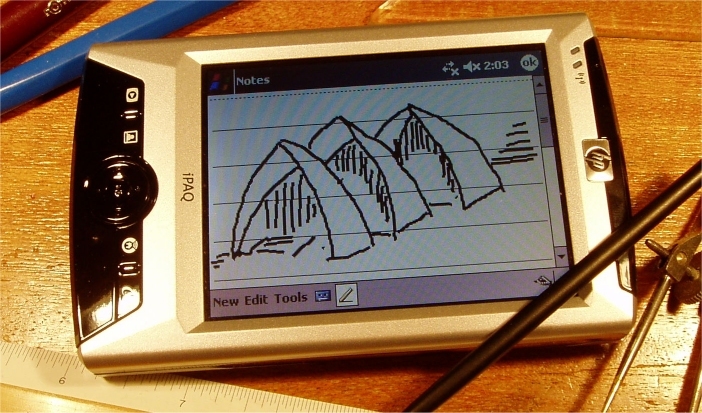 The articles discuss architectural drawings that are created, modified, coordinated, and communicated using computer-aided design tools. The Head Librarian of the Vancouver Art Gallery recently asked my permission to nominate Art and Artists in Exhibition: Vancouver 1890 - 1950 for the 2005 Melva J. Dwyer Award. This Award is given annually by ARLIS, the Art Librarian's Society, North American chapter, "to the creator of an exceptional reference work on Canadian art and architecture". Of course I said yes, and provided them with a copy of the recently updated and expanded project for the submission (Release 1.12). The Award will be announced April 3rd in Houston, Texas, at the annual ARLIS convention. It is a distinct honour to be nominated for this award, and we anxiously await the announcement. I would like to give special thanks to Cheryl Siegel, Head Librarian at the Vancouver Art Gallery, for making the award submission, and to Michael Clark, Emily Carr Institute Library, for suggesting the idea. Thank you, your continuing support is greatly appreciated. Previous winners of the award include the National Gallery database Artists in Canada (which listed me last year), the book Alberta Society of Artists - The First 70 Years, as well as work by the late Evelyn McMann, who compiled a tremendous amount of information into three standard reference books on Canadian artists. Whilst trying to get rolling in the New Year, I received an e-mail from the Alcuin Society asking if I'd be interested in writing an article on 40 years of Amphora, the Society's journal, for the upcoming 40th Anniversary Issue, to be published in September 2005. In typical Sim fashion, I said yes, and started collecting back issues of Amphora in order to have them at hand to read, review, annotate, and think about. Luckily the Editor donated 30 issues to me, Don Stewart at Macleod's Books provided another 50 issues at a great discount, and the Society itself turned out to have 30 of the remaining issues available for sale. Thus in short order I was ready to get to work. Although not originally scheduled to contribute to Amphora 137, it was decided to make the issue a review of the previous year's featured artists, and I was asked to contribute two block prints to the issue. I sent off a CD-ROM with scans of four recent works: Snow on Elms, Peace, Waiting, and Shucking Shed. On receipt of the issue we'll find out what was selected for publication. Sim Publishing took advantage of a week-long vacation over the Christmas holidays to add a substantial amount of information to the project. A number of exhibition catalogues were transcribed, including the first and second B.C. Artists exhibitions in 1932 and 1933 at the Vancouver Art Gallery. A number of artists' mini-biographies were created, as well as some supporting pages. Since the last update was posted additional institutions have acquired the project, including the U.B.C. Library and the Winnipeg Art Gallery. Thank you for your support. 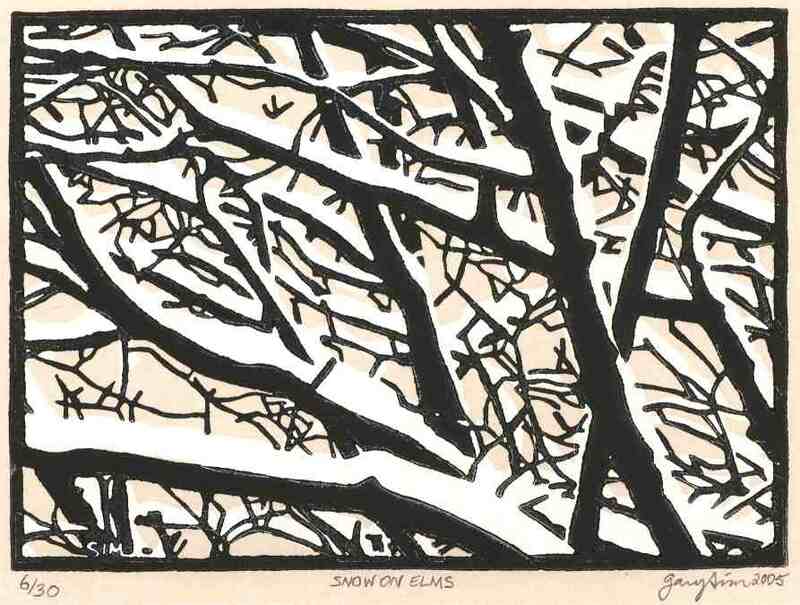 Taking advantage of a bit of snowy weather and icy sidewalks, we cut and completed our first two-colour linocut block print, Snow on Elms. This is a partial view from our window of the trees in our block. A number of variations are considered for this work - black only, black and white on grey paper, black and white on white paper, and black and grey on white paper. 12 artists' proofs were pulled of these options, and are under consideration before a final decision is made about the issue. The black and white on grey version is shown above. A display of nature photographs by Branislav Vrbaski is now on exhibition at The Daily Grind Cafe, 1500 West Georgia Street. The exhibition will be on display until March 18, 2005.